1962 is the year the PX 6120 model, one of the flagship model Gretsch guitars, changed to the new Electrotone bodies. There were many changes incorporated into these "next" generation style Gretsch guitars. The factory list price was $495.00. The previous single-cutaway, hollow body, open F-hole models switched to F-holes that were painted on (a Chet Atkins recommendation). The changes also included a redesigned "double-cutaway" body that was thinner at just 2." All of this was seen as a desire to compete with Gibson, who had done well with their Thinline ES-335 style instruments. It was not uncommon for instrument manufacturers to mimic each other during the innovative and booming guitar and rock music explosion of the 1960's. At the time of these changes, this model also received padded snap-on back pads which purportedly added "comfort." Some of the early guitar models had pads made with leather and gold trim that later changed to a pebbled-grained vinyl, however, this is one of only a few that I have seen that has a pad made of woven fabric with gold trim. Like many things "Gretsch, "consistency" was not a feature. 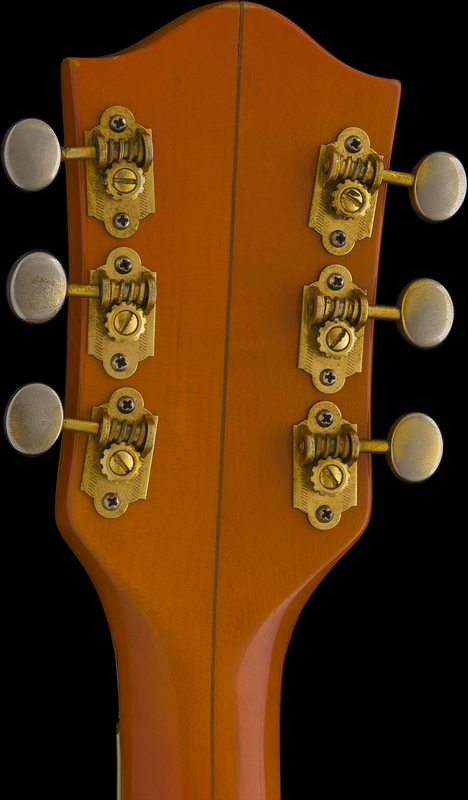 Being an early double cutaway 6120, this example has the Horseshoe headstock inlay. These were not dubbed "Nashville" models for a couple of more years when the Horseshoe inlay was replaced by a metal engraved headstock "name plaque." This was also the era that Gretsch introduced their "Stand-By" switch which was then implemented into many models. Beginning in 1954, the 6120 guitars were offered in a color they named "AMBER RED." It started off being more Brown than Orange, and as time progressed, the colors and hues evolved, eventually more closely resembling a bright Pumpkin Orange color, but name aside, these are visually quite exciting to behold, and the color is one of the features that give them instant recognizability! I have examined, tested, serviced and set-up this instrument and found it to be factory-correct in every way with the lone exception of a replaced Pickguard. This is a vintage Gretsch part (not a reissue) and is very similar to the original which was missing when I acquired this guitar long ago. The pickguards are made from a hard, thick plastic material that is generally not flexible, and are prone to cracking. The currently installed part has a visible crack from being over-tightened at the mounting bracket attachment screw, but it is still in 1 piece, and if treated sensibly, this will be fine. The guitar shows typical signs of age and minor usage but is generally in very nice, clean and solid condition. The thinly plated gold hardware has visibly worn in many places, but a lot of it is still intact. The electronics, frets, nut, tuners, finish, and all of the other plastic and gold-plated metal hardware are factory original, and all are present, including a working MUFFLER (mute). Vintage Gretsch guitars usually have badly deteriorated plastic body bindings, but on this example, they are reasonably nice and intact, showing only some minor shrinkage. The "comfort pad" is showing signs of wear, and although it's fully intact, it is beginning to fray and is a bit fragile, just an FYI. These can also be replaced if desired, but this one is original to the guitar. The CASE is the original and correct Chet Atkins "6220" model case for the 6120 guitar, replete with Western Motif and scuffproof covering. These cases have black tooled leather and saddle-stitched edging (trim) and are considered to be some of the best-looking cases that Gretsch ever issued. These higher end model cases ended within the next year or 2. This case is in Very Good condition with a functioning handle, latches, and hinges; however there is some discoloration where a previous owner sloppily re-glued the white vinyl material, and some of the glue left a brown stain, it is mainly below the handle, so please refer to the photos. The guitar has just been set up with a set of D'addario XL 10-46 gauge strings. This is an excellent and attractive example of a Gretsch double-cutaway 6120. The guitar is now 56 years old. I acquired it a little over 25 years ago. I had begun assembling a vintage Gretsch collection and had examples of every 6120 model produced as well as other Gretsch models that I liked. I have always loved the look and sounds of old Gretsch guitars. During my store days, I bought and sold many Nashville model guitars, but few of these "early feature" models popped in. Eventually, I encountered this example and decided to hold onto it as "healthy" examples were and are scarce, which can generally be said about many vintage Gretsch instruments, so I simply never sold it. I am now offering it for the 1st time, and as such, this guitar has been spared all of the circulation that most instruments being offered online today have undergone. If you might desire an uncirculated, clean and stable example, this one may appeal to you too, so kindly inquire. Weight: 7 lbs. 7.8 oz.